Continuing my obsessive reading of Seanan McGuire’s October Daye series, I’ve now finished the 9th book, A Red-Rose Chain. Before starting the next book in the series (oh, who am I kidding? I’ll be starting it about 5 minutes from now), I thought I’d share my thoughts on #9. Warning: Spoilers ahead! I can’t possibly talk about these books without referring to some plot elements, and since this is an ongoing series, it’ll be impossible to avoid spoilers for earlier works. You have been warned! 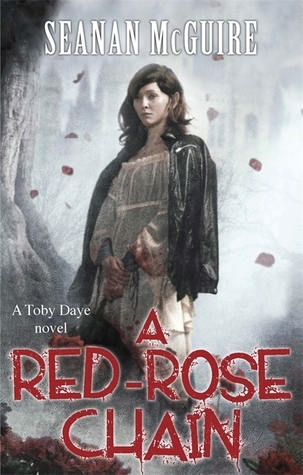 My thoughts: A Red-Rose Chain is another excellent edition in the Toby series, with fresh dangers and life-threatening situations. As always, Toby ends up covered in blood and with her life on the line. By now, neither of these are exactly surprising, but wouldn’t it be nice for October to have some time to — I don’t know — chill with her friends, plan her wedding, go to a movie? Really, anything where she’s not handling knives, swords, and arrows? In A Red-Rose Chain, October is send by Queen Arden on a diplomatic mission to the neighboring Kingdom of Silences to prevent a war. Things there are terrible from the get-go. The food is most likely poisoned, and the inhabitants of the kingdom have all been drugged into submission. Changelings are relegated to servant roles and are regularly abused, and even worse, are exposed to the deadly and addictive goblin fruit which caused Toby so much trouble a few books ago. The King is a usurper who believes in Fae racial purity, and in addition to his disgusting views, he comes from a line of fae that specializes in alchemical magic — which he fuels by stealing blood and body parts from other faerie races. Ick. His deepest desire seems to be getting his hands on Toby’s blood to take advantage of the magic that’s so powerful and unique to her. Despite being accompanied by her trusted entourage, Toby is in constant danger while in the Silences, especially once she realizes that the pretender queen she helped depose in the Mists is also there, eager for a chance to harm Toby however she can. I was practically screaming for Toby to get her people and get the hell out of there… but fortunately, Toby is much more of a hero than I’ll ever be! She knows that if her diplomatic mission fails, war will be inevitable, and war will cause far more damage to far more people than anything King Rhys can do to her directly. So, once again, Toby ends up in terrifying, excruciatingly dangerous situations where she’s on the verge of death, and I could barely breathe. The tension and suspense are killer. On the positive side, I love seeing Toby and Tybalt continue to deepen the bond between them. Their love is strong, passionate, and durable, and because of his love for Toby, we see some unexpectedly tender and vulnerable sides to Tybalt. I also really enjoy Toby’s relationship with her teen squire Quentin, who’s a sort-of son to Toby. Seeing their mutual love and support is quite touching. Toby has managed to create a family out of the disparate people who’ve entered her orbit, and while it’s an unconventional family, their trust, support, and unconditional love make it very real. I’d never been in a knowe this size with so little decoration. It was like Rhys had ordered the whole thing from Castles R Us, and then never bothered to swing by the local Bed, Battlements, and Beyond for the accessories he’d need to make it believable. I have charged headlong into portals, sealed lands of Faerie, and experienced more dangers than any one woman can reasonably be expected to both encounter and survive. I sighed, and stepped into the quaint little forest cottage. I loved A Red-Rose Chain. The adventure in this chapter of the ongoing saga is pulse-pounding, dramatic, and full of dire implications for the future — but it also moves the overall narrative of the series forward in a way that creates new possibilities. An ongoing problem in Faerie has finally been solved, but I’m sure that will lead to new complications down the road. Toby continues to build alliances and earn the trust of powerful people, but she makes enemies as well. I can’t wait to see what comes next… and hope we get that wedding with the King of Cats sometime soon! It’s so fun to get caught up in a series. I haven’t read one in a while, but I know how exciting it is to finish one book and start right up with the next one. Have fun! Thanks! I also vow that I’ll take things slowly, maybe read other books in between… but that never lasts! Well done – you’ve flown by me at the speed of light. I’ve not read this review because I’ve not started the book yet – so just being cautious. Look forward to reading your thoughts once I’ve caught up. Ha, I should probably take a break from series for a while! I do still need to read the newest Patricia Briggs book — have you read the Mercy Thompson series? Absolutely adore it.